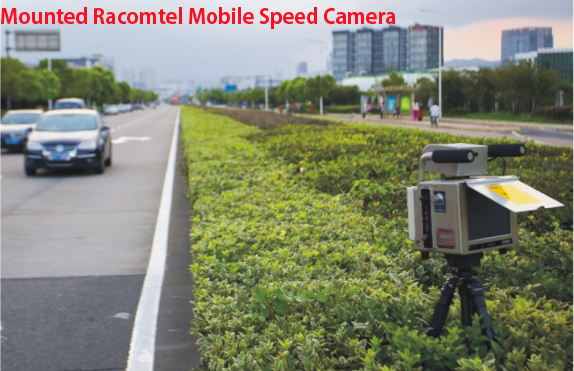 Racomtel has a long lasting and rich experience in speed monitoring. With this extensive experience we have developed configurations of digital cameras with different types of detection. The principle behind the different technologies is shown in a few clear animations. 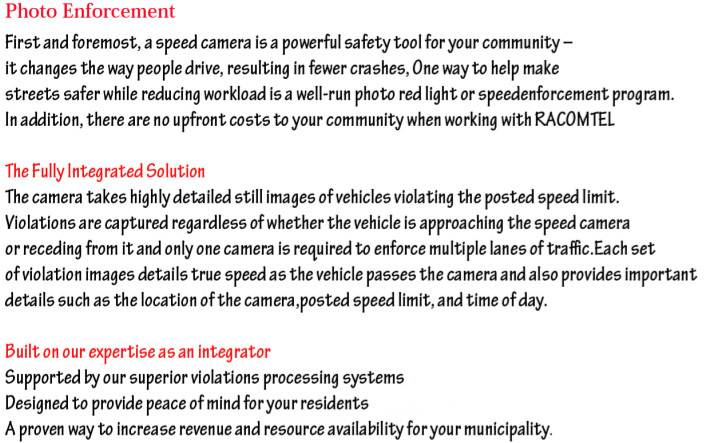 Each set of violation images details true speed as the vehicle passes the camera and also provides important details such as the location of the camera, posted speed limit, and time of day. No matter which violation metric we're measuring, Racomtel measures it more accurately than any other company. With practically 'zero' false triggers and an ability to excel in taking pictures regardless of the weather or lighting conditions, the Racomtelsolution delivers the highest capture rates, 24/7. Racomtel provides the highest levels of digital image and data protection to guarantee a secure chain of evidence at all times, from violation to citation. Enforcement cameras can be fixed at the side of the road, fixed above the road on a gantry, mounted inside a marked / unmarked enforcement vehicle or even placed temporarily at a roadside location, to be moved later to enforce another area. years of delivering purpose built photo-enforcement credibility, driving integrity into more than 45,000 cameras delivered to more than 60 countries. Whatever your speed problem looks like, Racomtel gets the whole picture. Integrated AMBER Alert feature added to every red-light camera to help you find the Nations Missing Children even more quickly or other vehicles suspected of serious crimes. Each detector is directed onto a single lane and projects a virtual loop on the road surface: the ‘footprint’. A vehicle present in the footprint area is continuously measured and the output from these measurements is sent to the NID unit. The trigger point (or photo point) is in the middle of the footprint and can be aligned according to the local and legal situation: on the stop line, before the stop line or after the stop line. When a car is in violation, in this case passing the trigger point when the stoplight is red, the NID triggers the digital Racomtel Traffic Camera, which will take a photograph of the offending vehicle. An optional second photograph is taken after an interval time or interval distance. 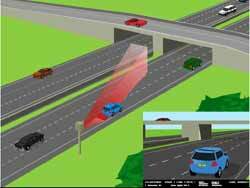 Employing the Racomtel system, the Camera can detect up to four lanes and can detect either approaching or receding traffic. 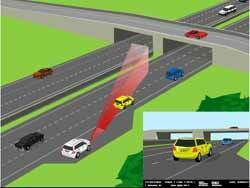 One Fixed or Mobile Camera can detect up to three lanes.